Clear Your Scuba Mask like many scuba newbies find mask clearing very tricky at first. Often they rush through this skill during their entry-level training, hoping to get it over with as soon as possible so that they won’t have to do it again. In reality, though this is the skill that you’ll probably use most often while diving. Here are a few easy ways to make this essential skill a snap. Just remember that when diving, some water may come up your nose. This is okay. Use these techniques to become more comfortable when clearing your mask, and you’ll become a much more comfortable diver. Clear Your Scuba Mask maybe that little water will disappear from the mask. Plastic debris doubles every decade. 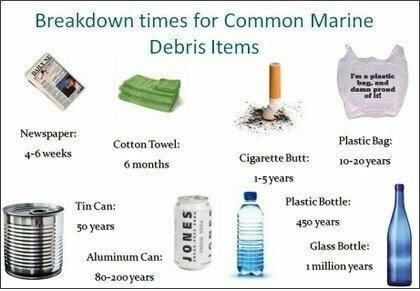 What ends up in the ocean is nearly impossible to clean up. Photo of a manta ray and sea turtle swimming amongst trash. A manta ray and a green sea turtle feed in the midst of plastic bags, milk jugs, and other debris floating off one of Oahu’s highest-rated beaches. Tony Haymet, former director of the Scripps Institution of Oceanography, has heard hundreds of ocean cleanup plans. Late at night, over many beers, he’s come up with a few dozen of his own. None of them, he says, has seemed likely to work. That includes this spring’s offerings. A Dutch engineering student, Boyan Slat, envisions a contraption with massive booms that would sweep debris into a huge funnel. Songwriter and music producer Pharrell Williams wants to fund the monumental cost of any cleanup by turning recycled ocean plastic into yarn and then clothes. The challenge is huge. For one thing, the garbage is spread over millions of square miles. For another, it’s made up mostly of degraded plastic, broken down by sunlight and waves into tiny bits the size of grains of rice. In the face of growing criticism, Slat had to back off his optimistic boast that he could clean up the oceans in five years. He posted a notice on his website asking the media and the critics to wait until he finishes his research. Meanwhile, the garbage keeps growing. Consider this alarming statistic from CSIRO, Australia’s national science agency, which is wrapping up a three-year study of marine debris: Every decade global production of plastics doubles. Even if someone came up with a workable collecting mechanism, how much impact could it have? 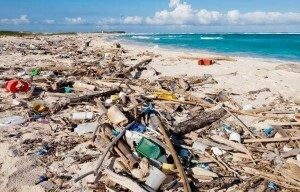 Photo of trash covering a beach in Aruba. Trash litters a beach in Aruba. Most of the garbage accumulates in five little-explored “patches” found in the doldrums of the Atlantic, Pacific, and Indian Oceans. The largest is the Great Pacific Garbage Patch, which starts a few hundred miles off the coast of North America and stretches to a few hundred miles off the coast of Japan; a more concentrated area lies between California and Hawaii. One commonly accepted estimate is that the high-density area inside the Great Pacific Garbage Patch contains 480,000 pieces of plastic per square kilometer (nearly four-tenths of a square mile). But scientists say that’s only a guess. Altogether the globe’s garbage patches contain 200 million tons of floating debris and ocean trash which just ends up on polluted beaches. Charles Moore, who “discovered” the Great Pacific Garbage Patch in the late 1990s and plans a research trip there in July, estimates that altogether the globe’s garbage patches contain 200 million tons of floating debris. 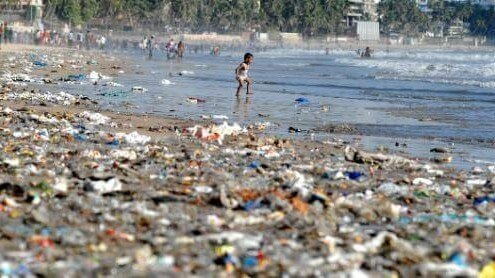 He came up with the figure based on calculations that 2.5 percent of the world’s plastic ends up in the sea. Marcus Eriksen, a marine scientist and co-founder of the California-based 5 Gyres, which studies the five main garbage patches, estimates the total floating debris is just 500,000 tons. In either case, the harm to fish and other sea creatures is increasing. A 2009 research trip to the Great Pacific Garbage Patch by Scripps found 9 percent of the fish had ingested plastic. Eriksen, with help from seven other scientists, recently analysed material in all of the garbage patches. Of 671 fish collected, 35 percent had ingested plastic particles. 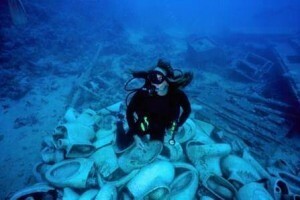 Photo of a scuba diver atop a pile of discarded toilets on the sea floor. A scuba diver investigates a pile of discarded toilets on the seafloor. Haymet and like-minded ocean scientists haven’t given up. They favor a low-tech, more practical approach to protecting the oceans from trash: Persuade the world’s people to stop littering. Only about 20 percent of ocean plastic comes from marine sources, such as discarded fishing equipment or cargo ship mishaps. About 80 percent of it washes out to sea from beach litter or was carried downstream in rivers, according to the CSIRO study, which is considered the most comprehensive. About half of that litter is plastic bottles. Most of the rest is packaging. Creating incentives to help reduce littering can be a political challenge. Only one of Australia’s eight main states and territories has a beverage-container deposit law, says Britta Denise Hardesty, who conducted the CSIRO study. In the U.S. only ten states—including California, Maine, Massachusetts, and Connecticut-have enacted container deposit laws. Opinion polls show support for such laws, but beverage manufacturers have opposed legislation. They argue that bottle deposits are more expensive than other forms of recycling and that requiring deposits constitutes a tax, which increases the cost of beverages. Who should Try Scuba Diving Experience? Thinking about giving Scuba Diving a try? Have you always wondered what it’s like to breathe underwater? If you want to try scuba diving in Cyprus, but aren’t quite ready to take the plunge into a scuba diving certification, Discover Scuba Diving is for you. Easy Divers offer this program off a beach called Green bay Protaras. While this is not a scuba certification, Discover Scuba Diving is a quick and easy way to introduce you to what it takes to explore the underwater aquatic world of Cyprus . To sign up for a Scuba Diving experience with a padi instructor, you must be at least 10 years old. No prior experience with scuba diving is necessary, but you need to be in reasonable physical health. Contact Us for Discover Scuba Diving experience on your next holidays in Cyprus. You going to learn the basic safety guidelines, rules and skills needed to dive. Easy Divers will be guided you with one of our Trained Padi Scuba Professionals. That mean under our direct supervision of a PADI Professional. You will be making an open water dive, that means you’ll practice a few more skills in shallow water to prepare for your scuba adventure. scuba equipment you use to dive and how easy it is to move around underwater with your gear. Learn about different fishes and turtles you will during your dive. Learn important skills that you’ll use during your Try Scuba Diving experience. Have fun swimming around and exploring while Scuba Diving. Once you have completed the Scuba Diving, you may wand to dive again or become a certified diver through the PADI Open Water Diver course. Contact Easy Divers in Cyprus, we are PADI Dive Center. Begin your scuba experience by signing up for a Try Scuba Diving program and get a Padi Discover Scuba Diving Participant Guide when you arrive for your scuba lesson at Easy Divers Cyprus. Your Participant Guide explains the experience and lets you pre-study the safety rules and skill techniques your dive professional will review with you. Our PADI Pro will provide all the basic scuba gear you’ll use including a mask, snorkel, fins, regulator, buoyancy control device, dive gauges and a scuba tank. When you arrive at our diving centre we will go over a Scuba Diving Flip Chart where you’ll learn more skills and the gear you will need to start your adventures in Scuba Diving. Breathing underwater for the first time is great experience and fun for all the family, so don’t wait get your scuba lesson booked!!! We have limited spaces on each day of Try Scuba Diving!